Srinivas Raju, the Director of sensational and controversial 'Dandupalyam' series is getting ready for another sensation with his next film. After depicting the horrific things of 'Dandupalyam' gang in a natural and gritty manner, Srinivas Raju has drawn motivation from another real incident for his next venture. 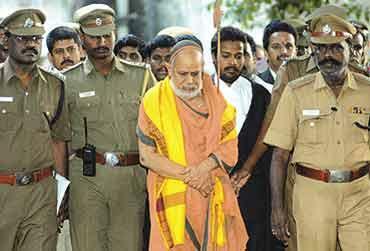 This time he will be showcasing the events revolving around the arrest of Kanchi Peetam Swaamiji, Shankaracharya Jayendra Saraswati. Director Srinivas Raju titled this film as 'Aacharya Arrest' with a tagline ' An Insult To Every Hindu'. Director has been preparing the script for two years meeting many people including close aides of the swamiji. With 'Aacharya Arrest', Maker Srinivas Raju will explore the events took place in 2004 at Tamil Nadu, following the murder of a devotee of Kanchi Mutt. Srinivas Raju feels that even though the case is closed, the real events should be told. Film will unfold several sensational events took place during the time which involves Political angle, Mysteries and Rumours. Film will also deal with controversies like Religious conspiracies and conversions. Srinivas Raju will also be meeting Jayendra Saraswati to get his version. Director says that why an Old priest who was doing charity got dragged into a murder case has raised curiosity. He also said that he had to dilute main theme of 'Dandupalyam' due to the nature of crime. But, 'Acharya Arrest' will be based on facts. Director is planning to rope in Stars and Major cast for this film. Aacharya Arrest( tag line: An Insult to every Hindu)...will be made in all 5 languages (Telugu, Kannada, Tamil, Malayalam, Hindi) Directed by Srinivas Raju and Produced by Ram Taalluri under SRT entertainments. We have to wait and see how much sensation this 'Acharya Arrest' will create in coming days.